For what purpose do you use the talking newspaper recorder? This statistic shows a survey on the purpose for using the talking newspaper recorder in Sweden in 2016. 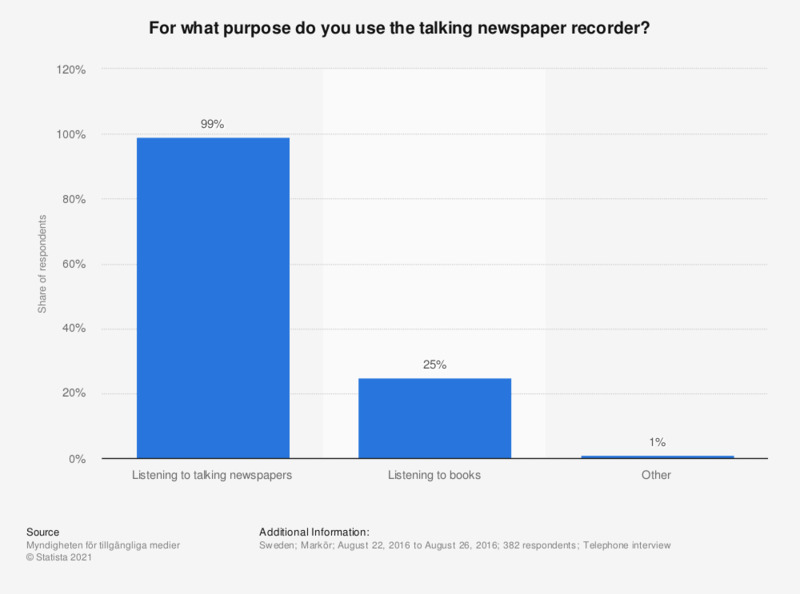 During the survey period, 25 percent of the respondents stated to have used the talking newspaper recorder for listening to books. This question was phrased by the source as follows: "Vad använder du spelaren till?" Statistics on "Newspapers in Sweden"
Could you tell me to what extent you read the written press? Do you read news in printed newspapers? Do you subscribe to a newspaper at home? How often do you usually read books and newspapers in your leisure time? How long do you read books or newspapers on an average day? How often do you use your talking newspaper recorder? How long does your child read books and newspapers on a normal day? Do you read books by means of another assisistive device than the talking newspaper recorder? How often does your child read books and newspapers in the leisure time?